We love this BC wedding that made the most of the sunshine holding out just long enough to say ‘I do’ and the best hashtag #dawnandkylewalkdowntheaisle! We also must point out the awesome ceremony spot with benches and a view. What really stands out though is the bride’s gown with the spectacular lace back. 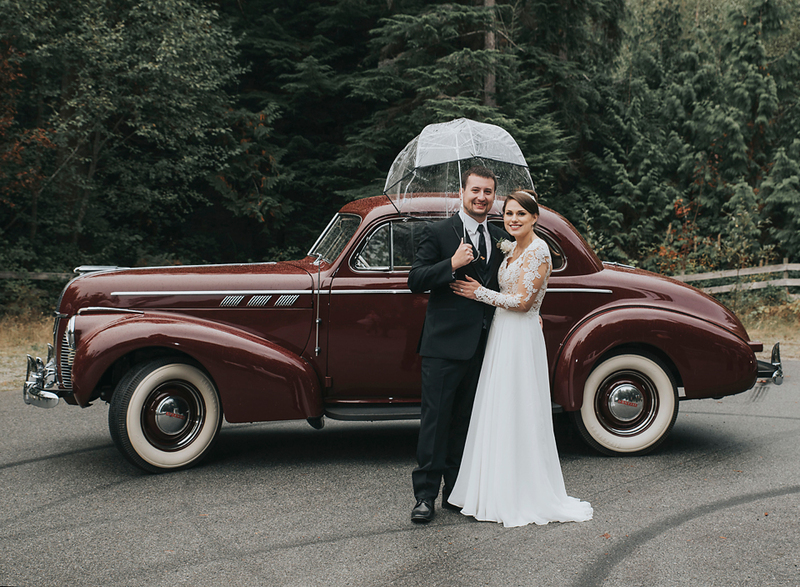 The gown is a Lillian West which Dawn found at The Bride’s Closet in Nanaimo and is a wonderful example of the current trend of cut out backs and lace sleeves. Of course, it would be most remiss not to mention the real star of this wedding – the car! A restored 1940 Pontiac Coupe that is the best showcase ever for Dawn & Kyle and friends. What struck us about this wedding is how local spots were used so well and added to the day! The photo that struck us the most though is of the little girl in bride’s shoes. A once in a lifetime shot that reminds us all of the little girl in every bride waiting to dress up! For Anton & Montana’s West Coast Wedding Story visit them here!